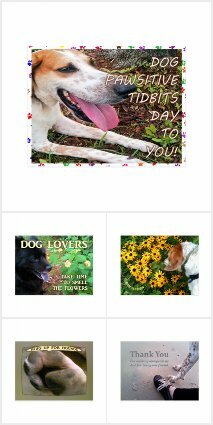 Do you know that tree hugger hounds can help save the planet? 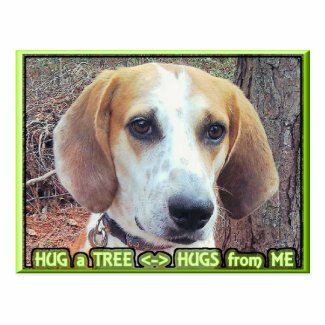 I am Valentino, a happy hound dog tree hugger, one who is ready to share a hug with anyone who answers the call of nature by hugging a tree. But of course, dogs need mankind to hug the trees too. Without your help in saving the trees, planet Earth shall not be saved, and tree huggers like me shall have no place to pee! My human companion, Ruthi, assisted me in making a video to teach you how to hug a tree, just like me! Oh! Check this out -- I do all the tree hugging and she gets a gratitude gift from Mother Nature! What's up with that? Well, I did get a treat for giving thanks, but I had to sit for it too, and I'm sure you noticed that I'm not too keen on sitting in pine needles. I do much better in the house, on a solid surface, or in soft grass. Now, go hug a tree! 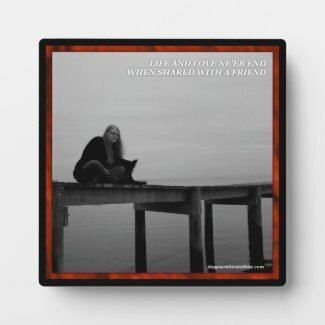 And send a tree hugging friend a postcard hug from me! 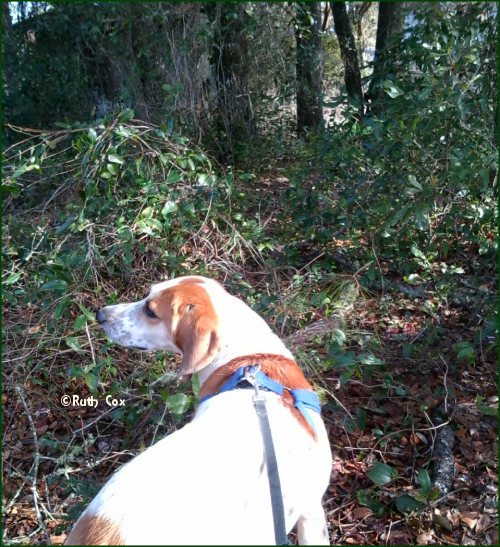 Nose to the air, my coonhound sniffed as if saying, "Who goes there?" The hunt was on! 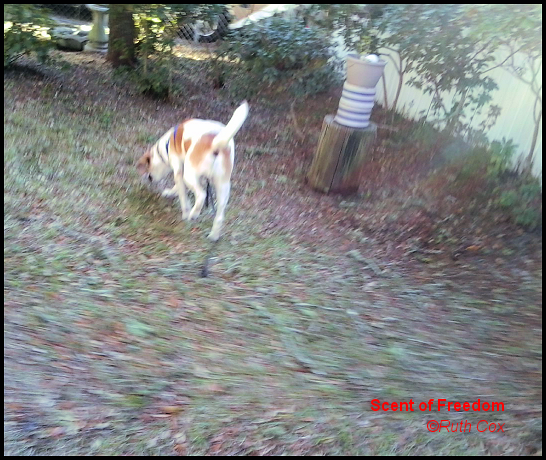 The dog quickly followed the lead of his nose to the ground, I following right behind him to see what I might see from allowing him to lead me around. Rarely was I disappointed when following after the lead of a dog and today would prove no exception. 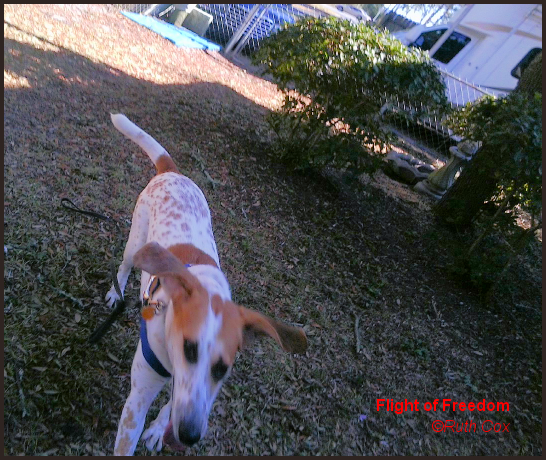 We rounded the corner a house away from ours, my dog Valentino running faster and faster while pulling me on his leash with much of his might. Suddenly he came to a stop, on point, quiet as a mouse. Now here we were, less than a block from our house. Following the focus of my dog, I finally saw with my eyes what my four-legged hunter had sensed from our back yard--a great white waterbird. There in a blaze of Florida sunshine, strutting its stuff along the side of the road, was the Great Egret. 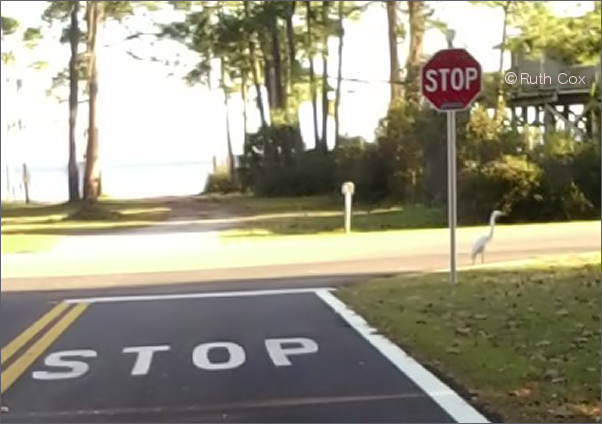 Ironically, my dog and I were held captive near the stop sign in front of us as we watched the egret waltz its way to its destination. This bird was hunting too. 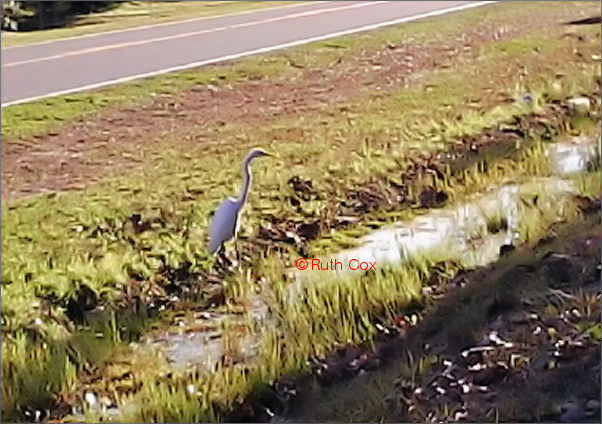 We followed the waterbird with our gaze, from about thirty feet away, to the water ditch alongside the roadway. There it stood still in the gully, seemingly forever, scanning the water for unsuspecting prey. Perhaps he might find himself a frog or a fish upon which to dine. Unfortunately, a biker passing by revved his motorcycle engine at the sight, scaring the bird into flight. Silently I cursed him for interrupting the Great Egret in its hunt for food and our amazing moments with one of Florida's fabulous waterbirds. Thanks to the Cornell Lab of Ornithology for the identification of Florida birds, by its yellow bill and long black legs, I was able to confirm this is the Great Egret. However, I am sure a good book about Florida's waterbirds would come in handy now that I live along the coastline of the Gulf of Mexico in the Florida Panhandle. 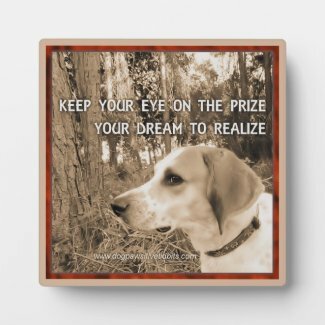 I must wonder, too, if my redtick coonhound, Valentino, might appreciate an egret dog toy to hunt in the house, and in all probability, destroy. 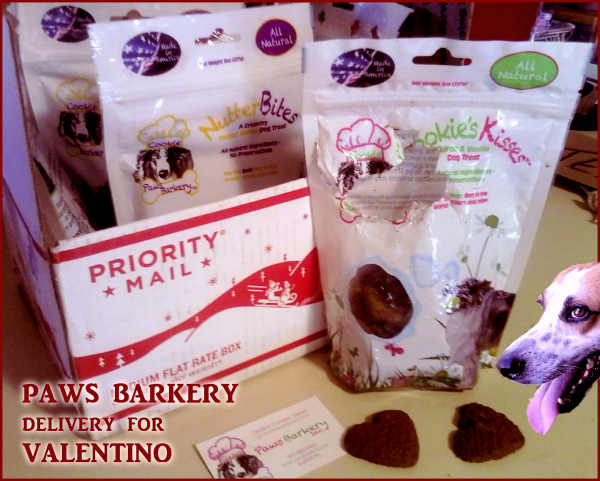 My dog Valentino and I invite dog lovers and bloggers to join us for our PAWSit Hop Saturday dog blog hop each week here on Dog Pawsitive Tidbits. Grab our badge and link up with us with your own dog-related blog post! Get the InLinkz code for your PAWSit blog post. 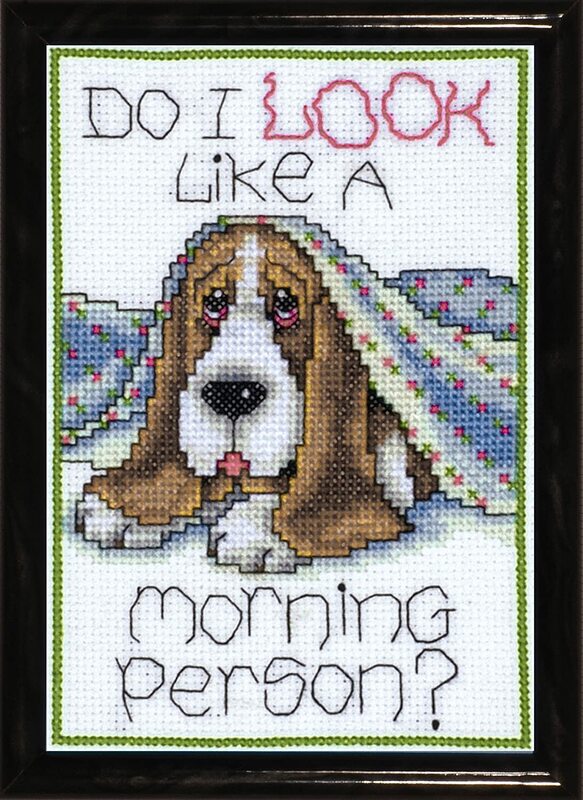 Dog or no dog, I am not a morning person! 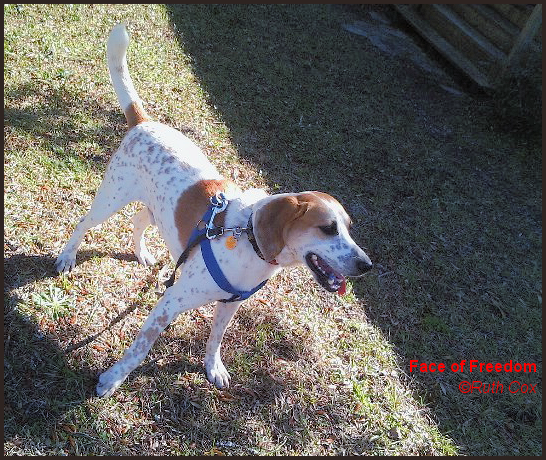 When my dog Valentino woke me at six o'clock in the morning after his first night of sleep in our home, I grumbled having to walk my hound dog with the rising of the sun — without coffee! Fast forward to today... I awoke at ten-thirty in the morning to a sleeping dog beneath the comforter while using my feet as his pillow! I woke Valentino up with gentle rubbing and whispers of love. 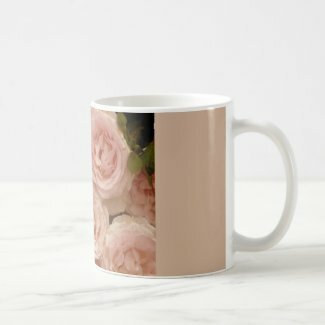 Upon rising out of bed, we headed to the kitchen for my first mug of coffee. I settled in at my desk to wake up my brain for writing this article while drinking my coffee. My dog Valentino nestled on his pillow bed on the floor behind my desk chair. When my coffee cup ran dry I headed to the kitchen, with the dog as my shadow, fixed his breakfast, then refilled my cup with hot coffee and went back to my desk. Upon finishing his morning meal, Valentino sat near my desk with pleading eyes for his morning walk. "Hot," I said. He backed away into his laying down place with head on his front paws, patiently watching me drink my second cup of coffee. With two mugs of coffee to wake me up, out the door Valentino and I went for our long morning walk. Our morning walks are so enjoyable, greeting the neighbors (humans as well as dogs.) 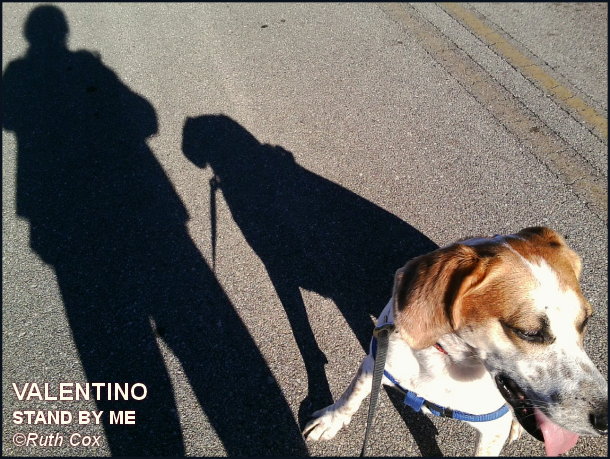 I generally allow my dog Valentino to take the lead on our first walk of the day, which means me often jogging along at his fast pace. There is, of course, a method to my madness — the hope of tiring him out so upon our return to the house I can finish off that pot of coffee while he snuggles up on the sofa for a morning nap as a couch potato while I begin my creative writing and design work of the day. Thrilled that over the course of a little over two months I have gradually trained my dog Valentino to understand that I am not a morning dog person. Now, in fact, I can also announce that Valentino is not a morning dog and I have my morning mug to prove it! We're linking our morning dog person article up with Writer's Unite over at Marsha's Spot. Read, write, and hop along with us! Take a hike in the woods with you and your dogs smelling like a rose and you needn't worry as much about ticks going along for the ride. I am living in a rural north Florida area surrounded by tick infested woods and thickets. 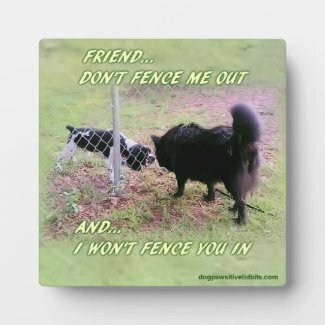 This presents a serious problem while walking my hound dog, Valentino, who prefers the wooded areas to the pavement, dragging me right into the thick of things with him. After each walk I would find and remove several ticks from my dog and a couple from me as well. I immediately put the dog on Frontline Plus to kill the icky tickies, as I call them. I was not happy about using the controversial chemical on my dog so I began researching more natural alternatives. After reading many articles about using essential oils as a tick repellent, I opted to give it a try. Based on articles I read as well as customer reviews, I purchased Rose Geranium by Edens Garden from Amazon. Interestingly, along with its many medicinal purposes, the plant which this oil comes from has historically been cultivated by many people to ward off evil spirits. Well, I consider bloodsucking disease-carrying ticks as evil as arachnids can be, so that works for me! Working to repel ticks is exactly what the Rose Geranium essential oil is doing for me and my dog. I did not administer Frontline Plus to my dog in early December nor in January. 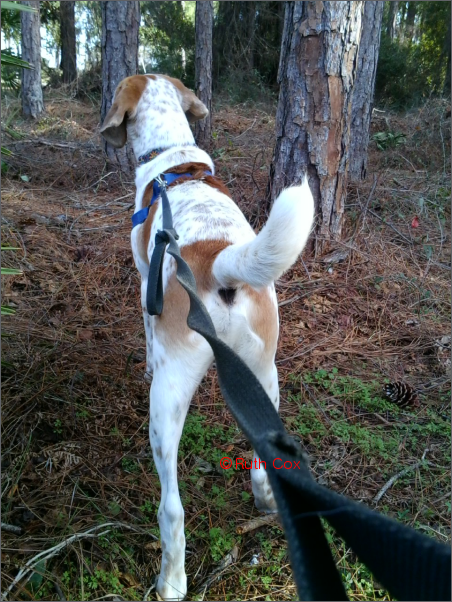 Instead, I administer the essential oil daily — a drop at the shoulder blades and at the base of his tail. And, of course, I give myself a drop too, at the hairline on the back of my neck. I am finding no ticks on either of us! Last week it rained for days so I did not apply the Rose Geranium until the third day when, yes, after we came in from a walk I immediately saw three ticks on the dog and removed one from myself. 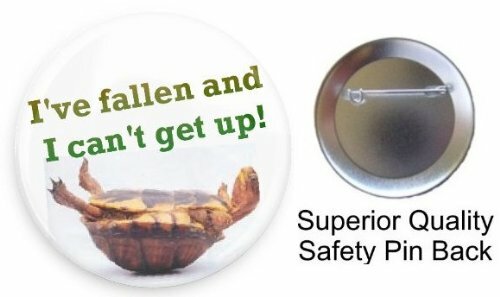 Now I reach for that little bottle of essential oil every day and no more ticks! No doubt about it, I am convinced. I'm sold on the use of Rose Geranium as a tick repellent. And ... My dog and I smell as sweet as roses! Dog Pawsitive Tidbits: From my personal experience I have found Rose Geranium a viable solution as a tick repellent for my dog. However, I highly recommend you discuss this with your veterinarian and/or medical professional before administering essential oils to your pets and animals. Further, do NOT use essential oils on cats. 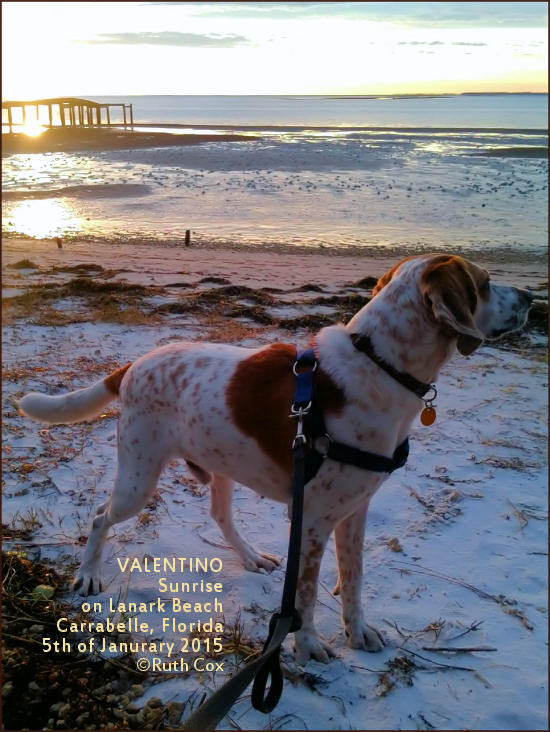 Dog stands in the morning glow on pearly white sand, not snow, o'er the Gulf of Mexico. 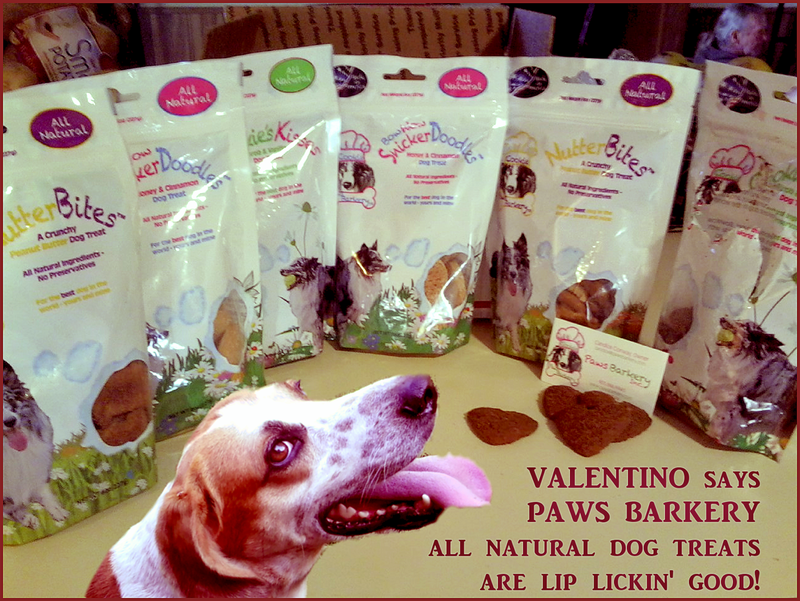 For another view of the rise of this sun of dog Valentino's and mine, read all about my new year resolution, my sunshine state of mind. 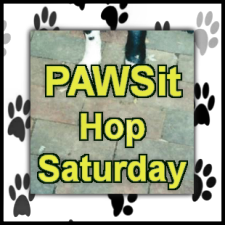 We are hopping along on Wordless Wednesday with the BlogPaws community. Add your picture paw prints to the blog hop! On November 5th of 2014 I welcomed my shelter dog, Valentino, into my heart and his forever home. After he wore himself out sniffing every item in every nook and cranny of his new surroundings he settled in for a nap on a dog bed fashioned from an old comforter that three past dogs had slept upon. I would drag that old comforter with me as Valentino followed me from my home office to the living room during the day and finally to the bedroom at night. It was the only place he would lay to rest or to sleep as he had yet to show anything other than fearfulness about sleeping on my furniture. 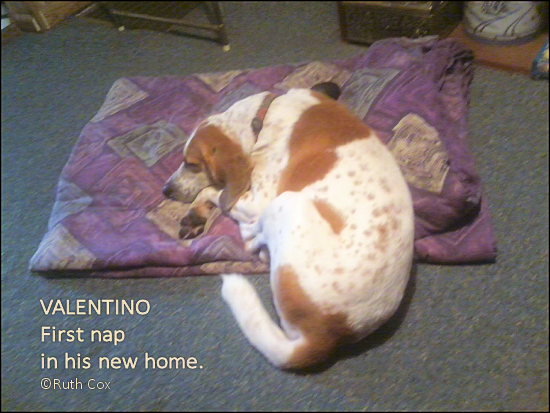 Then Valentino's majestic pillow bed for dogs arrived. Here again, something new for my shelter dog to get used to. Since he'd grown attached to the comforter, it remained his day bed while the pillow dog bed became his bed for sleeping in my bedroom at night. 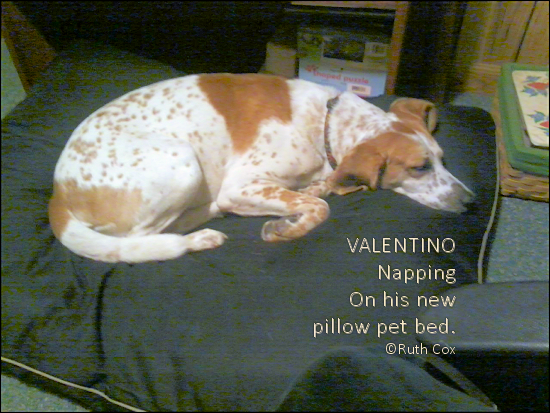 Of course, I longed for the day Valentino would feel comfortable lying on the couch and sleeping in my bed. The day finally came when he grew into a couch potato. And although at night he would prance around my bed and beg to climb aboard with me, I had set a rule about this — he had to want it enough to jump up there for himself. On New Year's Eve, my dog Valentino placed his paws upon the bed. The moment had arrived — into my bed he climbed! I think he was as amused by this event as I. My dog Valentino was quick to lay his head upon my pillows and together we rang in the new year, 2015, with a whole lot of loving. What happened to that comforter? It is now neatly folded to fit the floor of his crate. That suits Valentino just fine. And his plush pillow dog bed is on my office floor for when he wants to be near me while I work. If I'm in the family room, he is a couch potato. Our bedtime routine has become a time for us to cuddle up for a half hour or so. 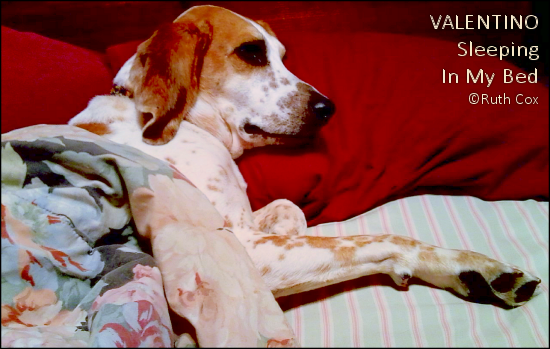 Then Valentino moves to the foot of the bed where he has his own pillow. And the two of us are now nestled in for a good night of sweet dreams of a happy new year. 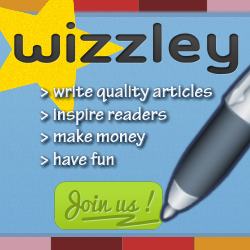 Grab our badge for your blog post and share a dog tale or two. We would love to get to know you and your canine companions. Grab the PAWSit InLinkz code.